Have a question? It may be answered here! Q: Why should you choose Midwest Grow Kits for your mushroom growing needs? There are many reasons you should consider Midwest Grow Kits for your mycology needs. Midwest Grow Kits has been selling mushroom growing supplies online for over 14 years. Starting on Ebay in 2004, we have grown and perfected the shroom growing process over the years. We pride ourselves on attention to detail and quality and offering the most competitive pricing. We have a dedicated customer service team and growing experts who are always answering phone calls and emails. Last year we moved into a new 4,000 sq/ft production facility in Algonquin, IL and now are supplying mushroom growing medium to research facilities, Universities, retailers and wholesalers across the US, Canada & overseas! Q: What are the shipping costs & services available? There are multiple shipping options to choose from at checkout. Please carefully choose the speed of service you need! We ship using FedEx Ground, SmartPost & Priority Mail from our Chicago based location. All packages are fully insured and discreetly labeled. All shipping costs and options can be viewed at checkout. Shipping costs to Canada, Alaska, Hawaii and the rest of the world are calculated based on weight at checkout. *NEW* Pick up at any Walgreen's! It's easy! Simply enter the Walgreen's address in the "Ship to" field and in the Business Name field enter "Walgreen's Pickup" Make sure you include your phone number. Stop by the Walgreen's with a photo ID to pick up your package within 7 days of delivery. Standard $9.99 (orders under $99.00) - This shipping service will be FedEx Smart Post for large items or Priority Mail for small items. Please keep in mind FedEx SmartPost takes anywhere from 3-7 days for delivery depending on your location, it is fully track-able. We can ship to any address you get mail including PO boxes with this option. FedEx Express Saver - This express air service delivers your package in 3 business days. When choosing this option your order will also receive expedited processing! FedEx 2-Day Air - This express air service offers guaranteed 2-Day service and delivers the 2nd business day. When choosing this option your order will also receive expedited processing! USPS Priority Mail- This service is available for customers wishing to use it. USPS Priority mail is a 2-3 Day service. Please note, selecting this service does not include expedited processing. UPS Ground- We now offer UPS Ground Service on all packages. This option is for customers that prefer UPS over FedEx. This option is available at checkout at a discounted rate. Q: I need my order fast, do you offer expedited service? YES! All orders placed with FedEx Express Shipping options include expedited processing and 99% are shipped the next business day. Q: What is your shipping cutoff time? Our shipping cutoff time is 11:59PM Central time Monday through Friday. All orders placed before 11:59PM will be sent to our production center the next business day. Q: Do you sell spores? We do not sell spores. We specialize in the growing mediums. Spore companies specialize in producing spores. Each kit requires a spore syringe to use. Every jar requires a little less than 1cc of spore solution each. Each Spawn Bag requires 3-5 cc's of spore solution each. Spore syringes are typically sold in 10cc syringes. For example, 12 substrate jars would only require one spore syringe to use. There are hundreds of websites specializing in spores. Some are great, some are good and some are bad. We have received countless reports and reviews from our customers over the years and will be more than happy to share that with you. Please contact us if you would like a full list of our recommended sites and sites to avoid! Many "cheap" or "bargain" spore sites buy their supply from overseas vendors from Malaysia and are usually very poor quality. Our top 3 list changes every few months based on customer feedback! We can proudly recommend the following sites as some of the best in the business all made locally: www.premiumspores.com, www.mushrooms.com and www.sporeworks.com have been around for many years and offers the widest range of mushroom spores, only the best quality and always top reviewed for years. 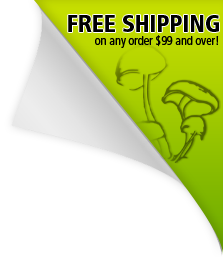 We recommend www.premiumspores.com they have extremely high quality spore syringes, great customer service, some rare varieties and an easy to use website and checkout process. They now accept PayPal and ship the fastest that we've seen! Q: How much spores do I need for each kit? Almost all spore syringes are sold in 10cc units. Typically each jar requires around 0.75-1.5 cc’s of spore solution. Each Spawn Bag requires 3-5 CC’s per bag. Spores last 6-9 months or longer stored at room temperature. Many people like to grow different strains in the same kit. This is perfectly fine as long as they require the same growing temperatures. Do not mix strains in the same jar or spawn bag. Q: What is the over-view of the process? How long does it take? the jars, adjust the heat to fruiting temperature and place each jar into the grow chamber and watch the mushrooms grow. Almost everything in the kit can be re-used so you can keep growing. You'll typically have your first harvest in 4 weeks!They will grow for an additional 4-6 weeks! 3-4 times! Q: Is shipping and billing discreet? Yes! We take the time to make sure your kit or supplies are packaged professionally and discreetly using only plain brown boxes, tamper evident kraft tape and no external logos or stickers. The return address says "Midwest Shipping Center"
Q: What is Bulk Growing or Bulk casing? Growing in Bulk is generally referred to as the process of using your fully colonized spawn bags or even jars to mix with a layer of mushroom friendly soil (Coir, vermiculite, Peat moss, etc..) Mushroom casing serves many purposes in bulk growing. It provides a medium to grow into, stimulates the formation of mushrooms, provides moisture and protects the substrate from drying out from the air. This advanced growing method is now perfect for beginners. Our Premium Select Casing Mix & Bulk kits make growing in bulk much easier! Q: Do you offer discounts on large orders? Yes, we do offer wholesale pricing and discounts on large orders. Typically our discounts start at orders over $500 or 10 or more of one product. Please contact us for details. Q: Why doesn't this promo code work? We run different discounts and offers throughout the year. Most of our discounts are for returning customers only. These codes eventually are shared by other websites and coupon sites so we have to change the codes. If you have a valid promo code and it doesn't work, please contact us for the updated code. We cannot apply a coupon code to an order already placed. Q: How long does it take to grow? With most of our kits it takes approximately 3-4 weeks for the mushrooms to incubate or colonize the jar. You will typically see your first batch of mushrooms in the 4th or 5th week. They will continue to grow for an additional 4-5 weeks with one "flush" or batch per week on average. Q: What if I have growing questions along the way? Q: What are the differences between growing in Jars and Spawn Bags? Growing in jars has always been the easiest way to grow mushrooms. Recently, growing in spawn bags has become just as popular. We usually recommend starting your growing experience with jars because they colonize faster and produce mushrooms quicker. Spawn Bags take longer to colonize, but can produce larger flushes or growth cycles. Spawn bags can be grown with jars in any kit and are the preferred way for growing in bulk. This more advanced method of growing allows you to break up your fully colonized spawn bag and mix it with a variety of different soil type materials to expand your grow. We now offer pre-mixed casing and Bulk Kits that make it easier than ever! If you are a first time grower and want to grow spawn bags we recommend a mix of jars and spawn bags. You can incubate your spawn bags right next to your jars and since jars will be ready first this will allow you time to practice while your spawn bags finish colonizing. When you place an order, you will receive an email order confirmation and a second email containing the link to our Video mushroom growing guide. Please make sure you enter your correct email address at checkout in order to receive your guide. When you receive your order it will contain tips and setup instructions specific to your kit or spawn bags. Every kit includes access to our easy detailed photo step by step video mushroom growing guide, which includes everything from start to finish. We also include tons of our personal tips and tricks to get the absolute most from your kit! Includes, growing, casing methods, re-hydrating techniques, quick drying technique and more! If you’ve purchased a larger kit or spawn bags, don’t forget to download and view your separate detailed setup guide so you know exactly what each part does and where it goes. Make sure you look for the postcard in your kit! Q: Do you accept Pre-Paid Visa/MC/Amex Gift Cards? Yes, we accept 99% of all Pre-paid Visa/MC/Amex gift cards. Please make sure your gift-card is registered for online use. Some cards require you to call or go online and activate the card prior to using online. If you are using multiple gift cards please call us to place your order. If you are having issues using a gift card please call us and we can enter it manually. All of our growing mediums are prepared fresh in the morning and shipped the same day. We ship Monday-Friday from our newly expanded shipping center in Chicago, IL. After placing your order typically your order will ship out within 48 hours. Please allow extra time for large orders or orders containing multiple orders of spawn bags. Depending on what shipping method you choose your order will be received within 2-8 days, based on your location. All tracking numbers are automatically uploaded in our system usually when your order ships. You will receive a tracking number email when your order ships! Please make sure our emails don't go in your spam folder. Q: Where can I find fully colonized mushroom kits and other cultivation supplies? Visit our sister website www.organicgrowkits.com where we sell ready to grow gourmet mushroom kits and other cultivation supplies, substrates and more! Q: Do you accept orders by mail? Yes! We give our customers a $5.00 discount on all mail orders. We save the money Paypal and Credit card companies charge us so we pass along the savings to you! You can mail in your order with cash, bank check or money order. Please include all the order details including shipping address and your email address so we can let you know the status of your order along with shipping information. We recommend printing this mail order form and send it in with your payment. Yes, we ship to PO boxes using UPS SurePost. If you want faster service to your PO box using Priority Mail, please contact us or call our customer service to place your order. We can get you the exact costs for your order. Q: Do you Ship to Canada? Alaska, Hawaii and rest of the world? Yes, please use USPS Priority Mail at checkout for Alaska and Hawaii. Our Free shipping promotion does not apply to Canada, Alaska and Hawaii. Please use USPS Priority Mail for those States and the rest of the world. To estimate your shipping costs, please enter your country and address at checkout. Q: Can I pick up an order from your location? Yes, If you are from the Chicago-land area and would like to pick up your order from our production center, please call us to place your order. Most orders will be ready for pick up within 24 hours. Our office and showroom hours are 10:00 AM- 5:00 PM CST Mon-Fri and weekend by appointment only.